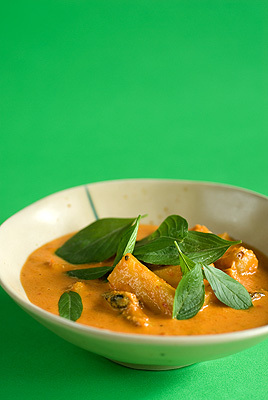 Coconut milk-based curries are among the first Thai dishes I ever tried to make. And they never turned out right. Never. I didn't know then that these kind of curries are among the most difficult Thai dishes to make. There are a couple reasons for this. For one, there are two very different ways of making them. 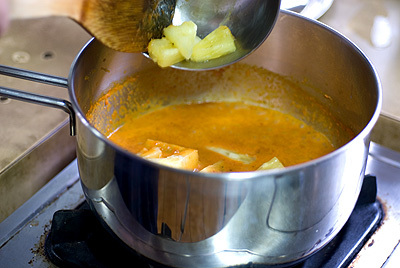 The most common curries, the ones you see with a layer of oil floating on top, are made my slowly sauteeing the khreuang kaeng (curry paste) in the "thick" coconut milk until the coconut oil "breaks" and emerges to the top. 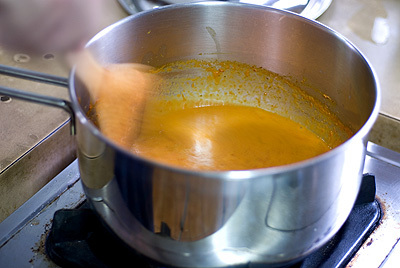 The "thin" or diluted coconut milk is then added towards the end. Alternatively, there curries where you begin with thin coconut milk, and slowly add the thick so that a layer of oil doesn't form! 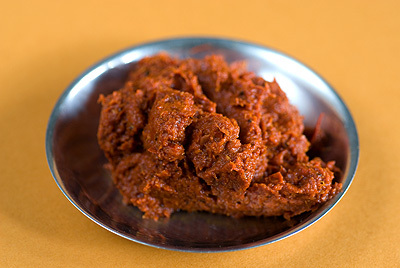 The curry below is the latter, and I think kind is much easier to make. Although one danger with this kind of curry is that it can get too thick and creamy. You want the end result to be just slightly watery, not too thick. If it does get too thick then add some plain water (or dilulted coconut milk) at the end. And remember to season to taste! 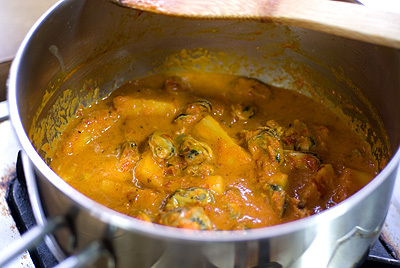 The pineapple in this recipe will give the curry a sweet taste, so only a bit of sugar (if any) is necessary. If you follow these directions exactly, and use some good-quality mussels, I guarantee you'll like this one. *Thin coconut milk is canned coconut milk that has been diluted, 50%, with water. **Thick coconut milk is the coconut milk that comes directly from the can. Wash and de-beard the mussels. Bring a large pot of a water to the boil and add the mussels, and boil until they open, about 3 minutes. When cool enough to handle, remove the meat and set aside. Discard the shells. Over medium heat, bring the thin coconut milk to a gentle boil. Add the curry paste and stir until fully blended with the coconut milk. Increase heat slightly and add mussels and pineapple. Gradually add remaining thick coconut milk, about 1/4 cup at a time, stirring to combine. Don't let the curry boil to rapidly, or the undesired coconut oil might separate. Add fish sauce, sugar and tamarind. Bring to a final boil and add remaining thick coconut milk. 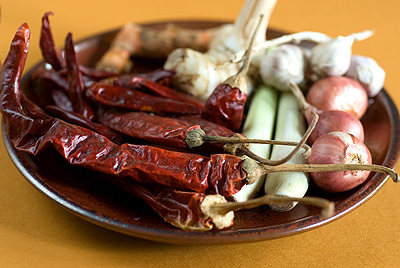 Serve hot with rice as part of a Thai meal.